I've started contacting tattoo places about the QR code tattoo, no responses just yet though. To make the pattern simpler I've loaded it up in Inkscape and started blanking out small sections of it whilst having the scanner point at the screen. The majority of the code seems to be redundant, theres a lot of version information there as well that can be cut out too. Hopefully a lot of it can be removed before its tattoo'd to make it easier to get on my accurately. A while back I bought some Thermochromic paper to experiment with, I saw a clock on a blog that used this in conjunction with nichrome wire to produce a flexible, flat, slow-changing display. The nichrome wire I have is a pain in the arse to work with, its coiled on a spool and retains it curve when cut off for use, making a 7 segment display damn near impossible. 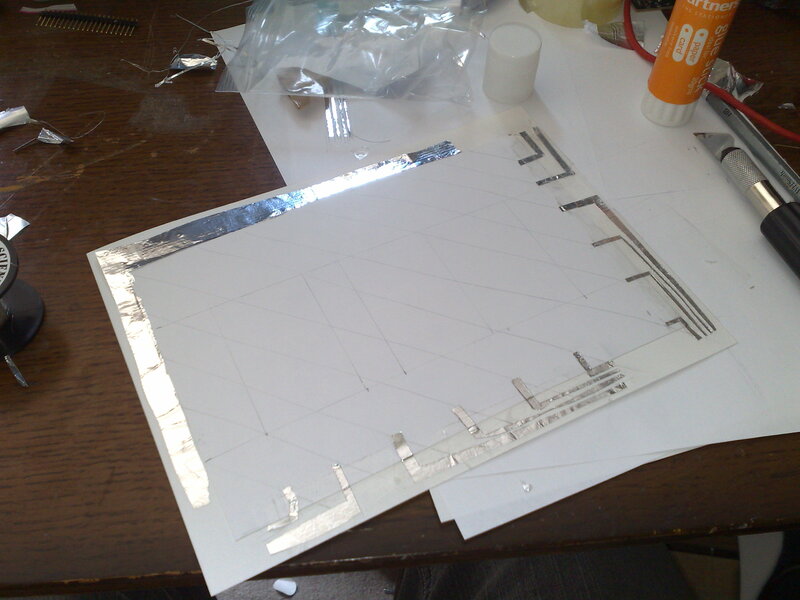 I've pritt-sticked a layer of foil down and then cut the traces with a sharp craft knife, luckily pritt stick is crap and doesnt hold the foil on too well so peeling off the unneeded parts is easy. After this one I might try to build a simple grid/pixel array like this. Complexity FTW!